THE INSPIRATION FOR FORESTER COMES FROM A GROUP OF TREES OR A FOREST. 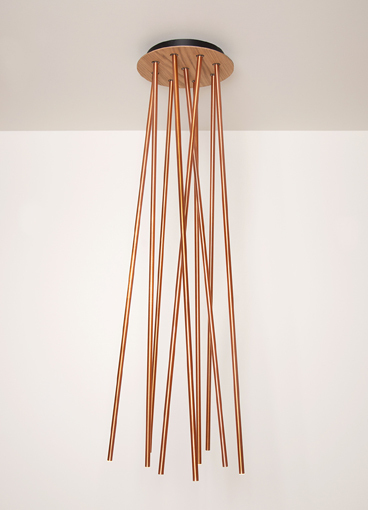 THE LAMP IS COMPOSED TO COPPER PIPES ATTACHED TO A STEAL BASE WITH A PLATE (wood PLATE is OPTIONAL). 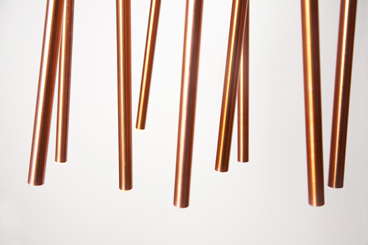 THE COPPER PIPES ARE LINKED TO THE BASE BY A BEARING BALL MOUNTED IN THE BASE. THIS IS DONE TO FURTHER ENHANCE THE USABILITY OF THE LAMP BY ALLOWING THE USER TO SIMPLY MOVE THE PIPES IN ALL DIRECTIONS TO SUIT CHANGING NEEDS FOR ILLUMINATION. DIMMER: AVAILABLE in driver. option.